Shown in picture above is one of the five new promotional item, all of which I will be showcasing in this post. Something very unique to me, Ramen Ten dishes out these delectable Ebi Gyoza, made from fresh ebi and chicken, combined and served in a plate consisting of four gyoza pieces. It actually tasted pretty good, savoury and refreshing. 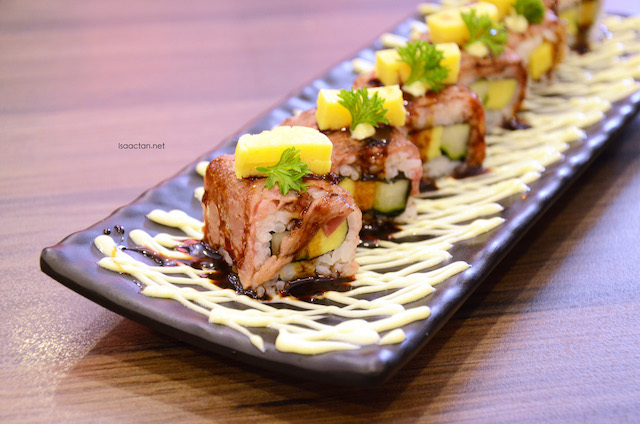 Served with lots of Ramen Ten's special made mayonnaise sauce, the Special Beef Maki is indeed one special creation. Wrapped with beef, these small bite sized maki is the perfect start to an evening of fun. I find the maki to be quite good, albeit the beef could have done with more flavours. The new Spicy Salmon Head Karaage dish came in a rather large portion, deep fried to a crisp with lettuce and lime on the side. I'm not a fan of fish head, but did try a small bite. 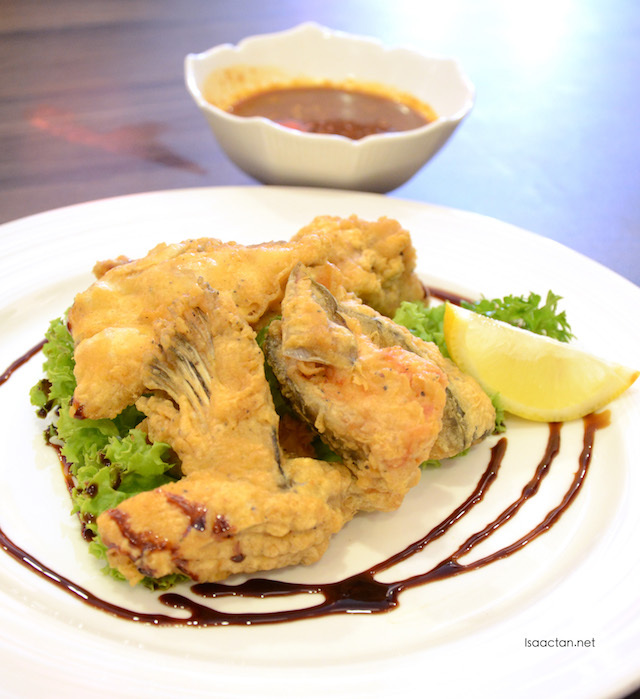 Go for this if you love your fishes, especially if you have a sudden craving for salmon head. My favourite dish for the afternoon, had to be the Chicken Teriyaki Mini Pizza. Diced chicken, with other condiments lined up each piece of gyoza skin, perfect bite sized for our eating pleasures. 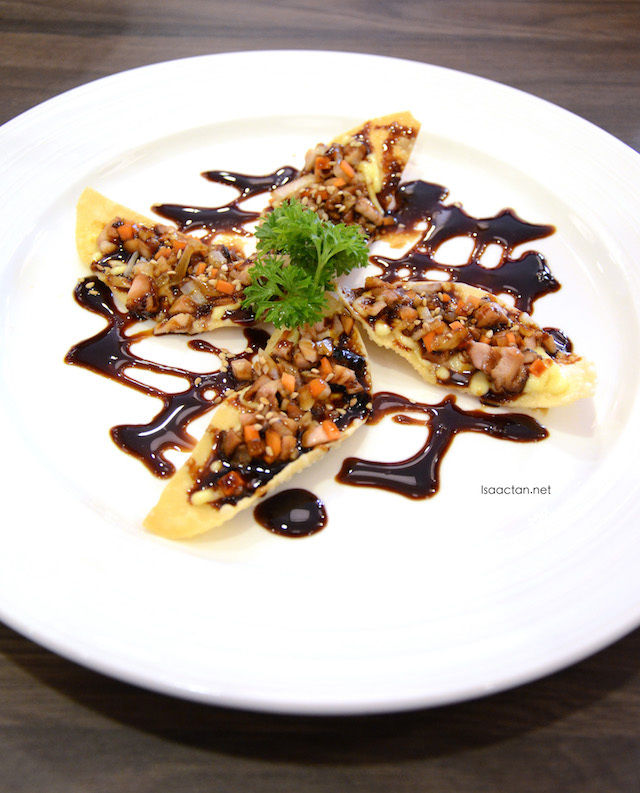 I totally love the teriyaki sauce used, which gives each piece that extra flavour, sweet and savoury. I loved it so much, we actually ordered two of the same dish. Three chicken dishes on one plate, both of it cold, which needs one to get used to. I was intrigued by the fact there were pieces of chilled chicken karaage on the plate, which I had problems getting used to. 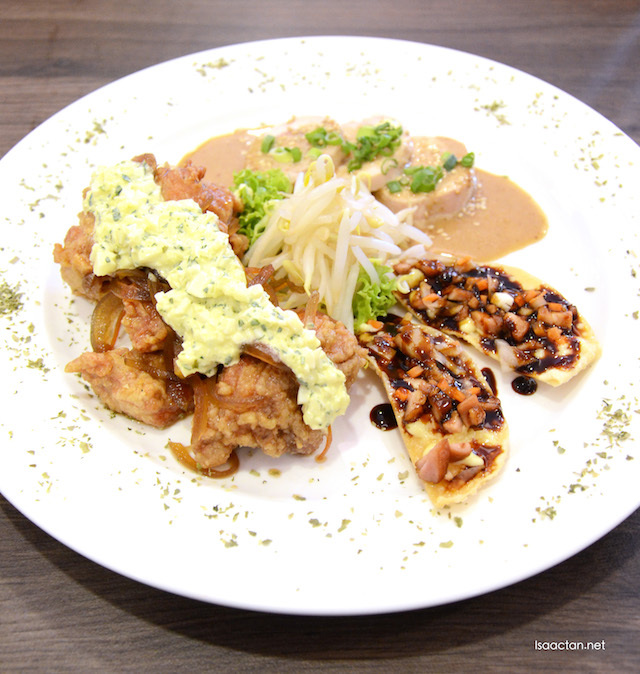 Santen Chicken Combination, after a mouthful of the chilled chicken dishes, I wished I could heat it up after. The chicken pieces doused in sesame sauce actually tasted pretty good, one which I attributed to quality sesame sauces. 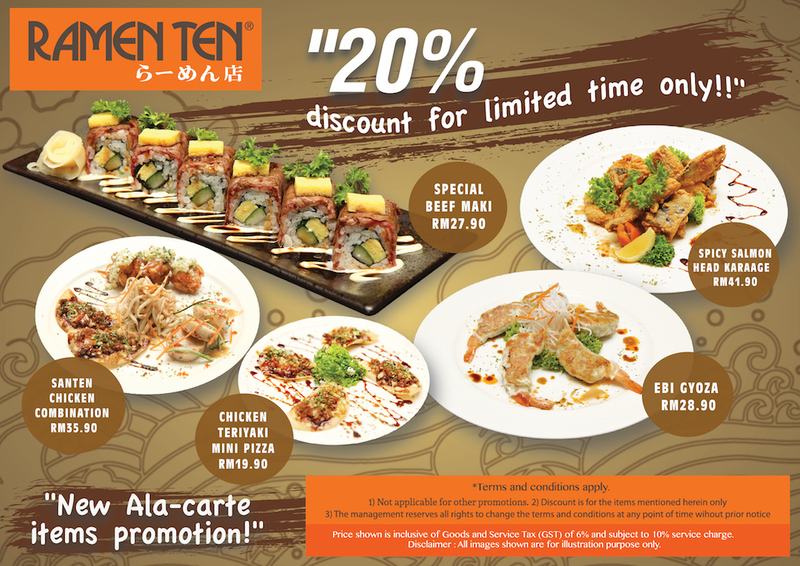 Below are Ramen Ten's other outlets address, contact and coordinate, so do check them out the next time you have a craving for Japanese cuisine. Nice, not cheap...but nice. No ramen? The beef maki looks so tempting. And there is one that is near to my place. didnt know that their dishes are so creative! Especially the mini pizza. Did you save some for me? so many food to eat now. My dear always google find food where nice to dine. Now we know where to go. Gosh so many restaurants I haven't heard no tried before. Price might be a wee bit steep especially for lower income ppl like me *sobs* belanja pls bro haha! These dishes look delicious!! But I was scrolling and reading wondering where is the ramen... hehehe.. never tried his place before thanks for recommending! Ola! 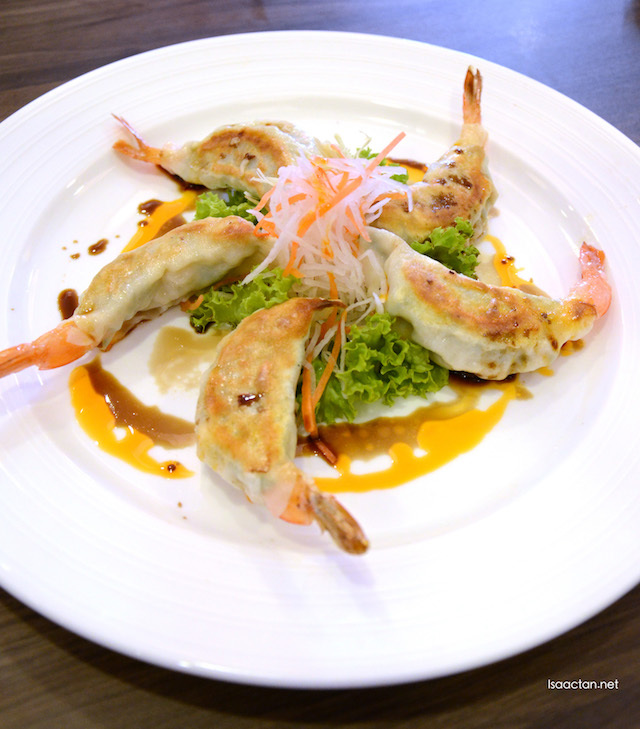 the Ebi Gyoza is so tempting la, Jaya 33 is quite near my place. Perhaps can try out their new menu.